This topic is for discussing and documenting the Little Tribune Bay Nest, which can be found in the southwest corner of Little Tribune Bay. Last year, the eagles of this territory seemed to be sitting on the nest for a while but we saw no offspring. You can see the posting from that season here. I found this nest, with one eaglet on it, in 2012 after Booni told me she had heard an eaglet in this area previously, but had not yet found a nest. The observations of that year are posted here. Click here to see the 2010-2011 discussion about this nest. Click here to see the discussion from 2009-2010, which is when Booni discovered the existence of this territory. I went to check this nest on the morning of June 24. 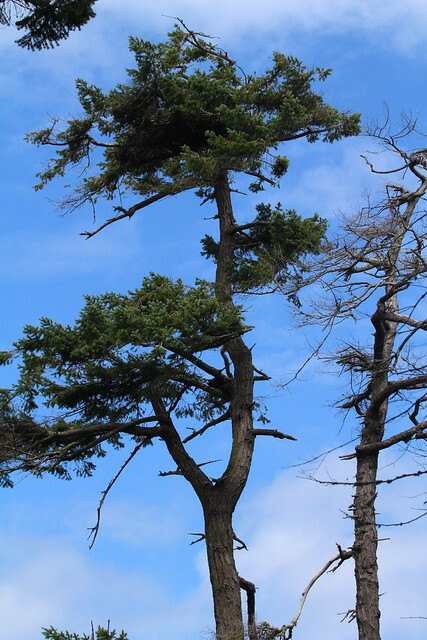 Here's a view of the scrawny little nest tree. It amazes me every time I see it. I could see nobody in the nest from that point of view, so I made my way down to the beach to get a different angle. Soon I saw an adult eagle flying by. The eagle flew over the edge of the water, probably looking for food, then circled back and rode the updraft above the bluff on which the nest tree sits. 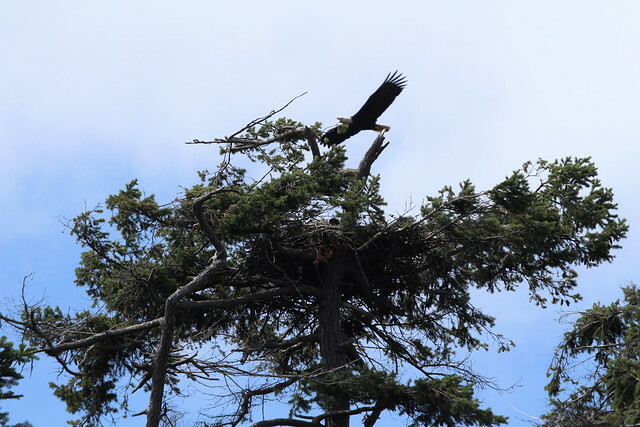 When this eagle flew over the nest, someone in the nest started screeping! 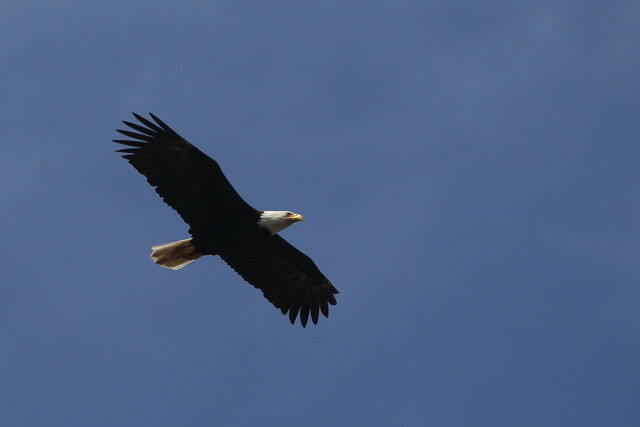 The eagle continued patrolling the area, with the eaglet calling each time the adult flew by. That little bit of dark head in the last photo is all I ever saw of that eaglet. I only heard one voice calling, so quite likely there is only one eaglet in this nest.